Discussion in 'Edged Tools' started by Mr. Tettnanger, May 12, 2015. I have been on a Skookum Bushcraft Jag lately! I have owned and sold about 6-7 of these over the last few years! I have been Skookum dry for a while! My custom order from Rod came due about 2 months ago! I custom ordered, 3V steel, black micarta, 2 lanyard holes, stainless hardware! I love it! But.......my OCD is kicking back in. I began thinking that maybe I ought to have one SBT of the three most common blade steels! So, when a A2 version with brown/natural micarta came up at a great deal, I jumped on it! Tonight I jumped on another A2 blade, but with red micarta. I have never had one with red micarta so I decided to invest in it! I sure do't need them, but they are pretty cool to fondle and play with! I figure that I will sell or trade the extras off, but I am pretty excited to have the chance and ability to at least have the chance to experience them! Here are a few photos of my black handled Skookum and my recent backup brown/natural handled version! I will post a few photos of all three when my red handled model comes in! 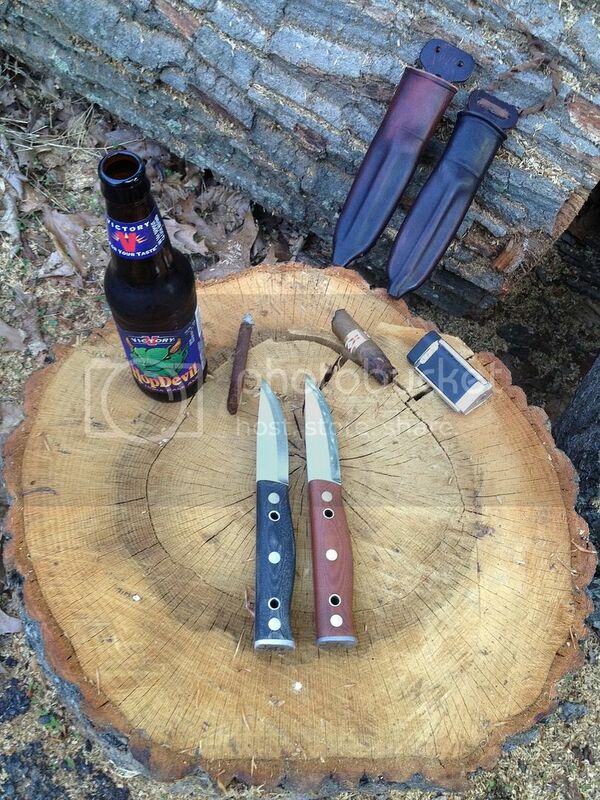 Please feel free to share your Skookum Bushtool Photos! buckfynn, Andster, ARPILOT and 7 others like this. I just want to handle one to see what the fuss is about. They look super cool! Winterhorse, seasonofthewoods and Wilt like this. Thanks for sharing, hope to have one of these beauties in the future. Haha, i used to live in downingtown, and was like 5 minutes drive from Victory brewery, good times. seasonofthewoods and Wilt like this. If you ever venture back this way, let me know! 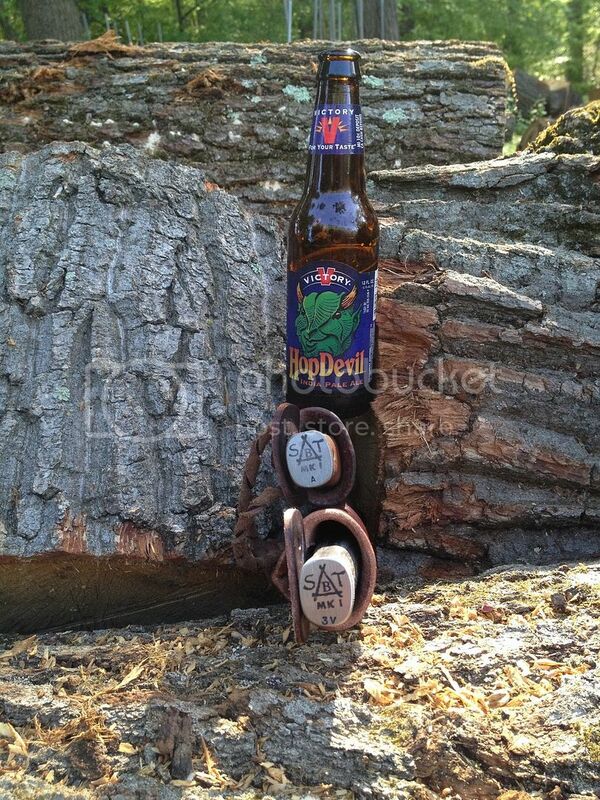 Beers on me, and have a wooded back yard to mess around in! I'm on the Thorndale side from Victory = 10-15 minutes from "Heaven"! junglas, seasonofthewoods, hdlv and 1 other person like this. I was about to tell you that you have a major problem... then I realized that six months ago I had no Adventure Sworn knives, and now I have five. So, I guess what I'm saying is: Carry on. LOL. I agree with Boomchaka about seeing what Skookums are all about. I like the looks of them, that's for sure. I will play too. I also bought another one tonight. ARPILOT, deckard313, Winterhorse and 1 other person like this. junglas and Wilt like this. What the story with those sheaths? They look very different. You like them? They both are original as far as I know! They are definitely different from one another! The one with the black handled one is original for sure. I got that set direct from Rod, brand new. I think that they are pretty goofy. But, I have a sweet dangler setup to use on one so that it makes them bearable! Thanks for the picture time guys. Get on the list now and in a few years you can get one for around $250.00. I really hate to be that hating guy but he very much lost me at micro-tanto tip. Is this a phrase he came up with or did the Internet? Even so this would appear to me to be nothing more than a design flaw to overcome and nothing more, frankly it looks like someone pre-snapped the tip off and decided to sell it for $19.95 for a limited time only as pre-broken in. I get the shearing hole, I get the rest but frankly seeing any tool maker not add a drop or clip or changing heat treat, steel, anything else but selling them instead with a "micro-tanto" really cheeses me off on the entire blade. buckfynn and Crooked Penguin like this. Yeah the broken tip is a big turn of to me,also seems kinda cheap. Excellent knives. Great edge geometry, ergonomics, steel choices, heat treat and sheath. Brian then why do they break? I am not being a jerk, but if these knives are so excellent why should there be any need for things like a micro-tanto? A tanto as you know is a stub tip or similar made originally on fighting knives in Japan and has nothing to do with anything of this sort. Though they work great for an alternative Ulu option. Very cool for that. Like an xacto. I'm trying to hold my tongue but I'm kind of sick of this, I would snap a Skookum Bushtool in half probably I don't care what steel it is. And I most certainly would get the tip snapped. I know what I am doing but the tool should too. The Adventure Sworns in the pic above yours all have drops, it's simple. Why the need for a gushing pic thread for some maker who is not even on here and has no need to talk here? Take it bladeforums or something where people just talk, for now show me a knife that does not need the tip snapped off first... My Turley does fine stabbing oak. Do we only carve here in perfect woods? 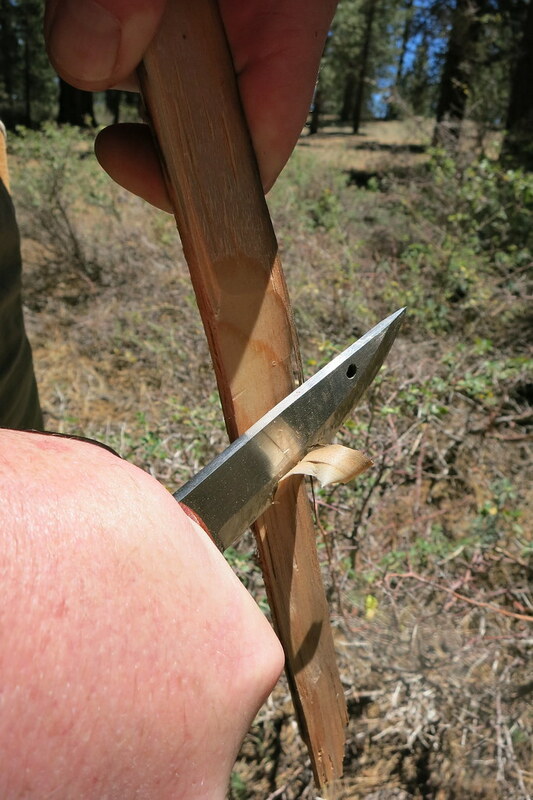 Or do we make fires by splitting wood with a knife and or making shelters the same way? I want a knife I can stab and twist plain and simple. I honestly just find the entire thing dumb. And nothing more. Here I offer you special options of my pre-broken knife, give me a break but take pictures and share them on he Internet... Here is my latest Macy's purchase it's pretty cool! Pinterest! Take it to blade forums. Sick of Skookum threads for a few years now. They look neat and I get the idea but frankly I'd much rather have one of yours with a proper tip than this Pre-broken junk personally. What a slicer! Fix your grind. Period. Start a fire instead. Congrats on your latest expenditure of money! Disclaimer: I have zero money in this game but I think it's dumb. That's about it. Thank you cellis, I caught quite a bit of crap for similar questions, I hope you fair better. Seems like an easy way out for the maker to address a common problem. They do look like neat knives but I think it stinks he makes everyone settle for a busted tip right off the bat. To me it would make more sense for those that break their knife should have to deal with it not everyone. I know what you are saying Dr. J but I'm still not sure I agree. It is a wonderful design and a geometry made for super sharp but... I think he as a craftsman I don't get the hype. I'm playing jerkwad tonight sorry. I m gonna start a thread about my love for Olfas tomorrow and see how that goes. Yep...goofy as hell .....but they ROCK. I really like them....but hey....I'm weird like that. You spelled hey wrong. Good night. Hahaha ..I had to Google Olfas......you sly boots. Hold on, before I comment, I have to go back to page one to see what this thread is all about, be right back. Ok. I really like the black. I just got a SAK Farmer from an awesome member here in black and every time I take it out of my pocket to use it I end up just staring at it for a second or two because it looks so nice. I think to have a really objective and informative thread, you should have a Skookum in each of the blade steels AND each of the colors. 3v in black is what Darth Vader would carry for sure. Yeah.....I really like the black the best by far! I'm keeping that one for sure! The other two will need new homes I think. I don't need to start a collection! That would make my OCD flare up and put me in therapy! Why don't you guys just use moras, they do everything a knife should do and they cost like 2 bucks. Sometimes mora will even pay you to use their knives. I wasn't sure about clicking on the link Machine, but I was laughing out loud after the first two seconds! Ya gotta wonder about people. Recording and uploading a video is a long, multi step process. At no time during this process did this chickdude think "maybe this is dumb and I shouldn't bother doing it." I was glad I had my Skookum but just prefer natural wood scales So sold mine last week. Wished I could have kept it but only need so many knives and wanted other toys. Yeah, I wish it did not have the micro tanto but was not going to have a meltdown over it or try to rain on someone else's parade. Mr.Tettnanger enjoy them ! I post here only to admit my shame at having gotten rid of it; never should have, but I traded it towards my first Turley, which had started another addiction, but then I had to sell that Turley to cover the ER bill from when I sliced my hand open with it. The real question is, "Would I have cut my hand in the same way if I had kept the Skookum?" I'll never know, because the Oracle won't see me any more because of all of my stupid questions. I really like the green handles, but now black is the new green. . .
Crooked Penguin and jkfisher84 like this. How does one contact rod to get in the list? A couple weeks ago I emailed the address on the website to see if I could get on the list and there has been no reply yet. He'll get back to you in a few weeks or maybe a month. Eventually though he will. I like SBTs and I'm on the list for 3 more. The SBT is what really got me turned on to Sargent's knives and I love them! On a side note I also thought the WSK/ Tracker was a gimmick tool until I gave one a try. I was really impressed. I'm not a one tool person and I like variety and respect them each for what they are and the rolls they fulfill. If you don't want the micro-tanto tip, ask Rod not to put one on there when you order the knife. Simple as that. When you're grinding the bevel you can pull the pommel of the knife towards you as you get closer to the tip, decreasing the bevel height near the tip. I don't think that was...nevermind. Yeah........that was a nice one! I kicked myself for a long time after letting that one slip through my hands! Don't feel too bad, that one didn't have the micro-tanto tip and it did have that silly hole in the blade! It cuts nice and its the perfect size for a do everything blade. The handle is super comfortable and it is somewhat easy to sharpen despite being stainless. The spine is cut sharp and works awesome with a ferro rod. I do not notice any issues with edge wear. As far as the micro tanto tip. I think its a good thing. Rods tips were really pointy and I would be pissed if I had a really pointy tip and messed it up. From what I have read they were all breaking, hence the reason for the creation of the MTT. I absolutely love the pommel on the SBTs. I think that feature makes the knife what they are. The sheath that it comes with is really bad IMO. I would not want to dangle that blade from my neck unless I was wearing something with a thick collar like a heavy coat. I think it has poor retention too. I could have shaken it out of its sheath. The lanyard / lashing holes on the handle are in a awkward location. They are under your palm so using a lanyard is funky and I really would not tie my blade to a stick. Mine does not have one but I think a shear hole is silly. I am not saying Mors ideas are wrong, but some of them are not for me. Selling my original and getting a replacement one was a great decision. I sent in my blade and I picked up a custom job from Bart at Kaweah River Forge. He is a nice guy and makes quality goods. This is my second sheath from him. It has much better retention as well as a broad range of carry options. Is that green or black micarta? Hard to tell on my phone. 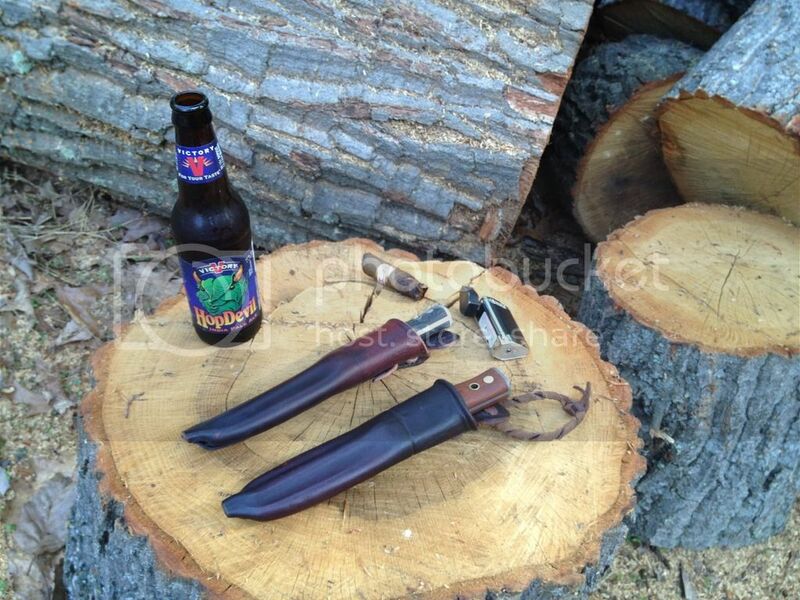 I may look into getting a custom/different sheath made.